There is only ONE reason to pick up Jupiter’s Legacy Vol. 2 – the gorgeous art of Frank Quitely! Just like in Vol. 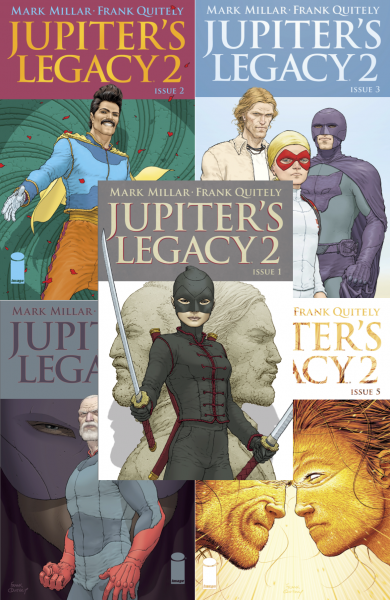 1, the plot and characterisation on Jupiter’s Legacy is sketchy and superficial at best. As usual, the concept is a rip-off of Alan Moore’s Watchmen and executed very badly by writer Mark Millar. Vol. 1 explored the generational conflict between a group of aging superheroes known as the Union, who used the powers they gained in 1932 for the betterment of mankind, in particular their leader, Sheldon Sampson (aka the Utopian), and their children, who are daunted by the prospect of living up to their parents’ legacy. The conflict expands to include Brainwave (a.k.a. the Utopian’s brother Walter) who is disgruntled with the Utopian’s refusal to get involved in political affairs and recruits Sheldon’s own son, Brandon to violently resolve this impasse. Sheldon’s daughter Chloe, together with her husband – the second generation super-villain “Hutch” Hutchence and their son Jason Hutchence – oppose the new world order but must lay low in fear for their lives. This volume basically resolves the issues raised in Vol. 1 although in a most unsatisfactory manner. Millar seems to be trying to come up with quite a few different ways for superheroes to do battle rather come up with a solid plot and relatable characters. But that is precisely what we have come to expect from Millar – all hype and no substance. He is effectively the new Stan Lee! Certainly, with Millar’s company Millarworld having recently been acquired by Netflix, presumably he is leaving enough gaps for movie/TV development and adaptation to take place. Which is a pity because there was sufficient potential in the early issues of Vol. 1 that was never followed through by Millar. Again, typical of Millar and should be no surprise to anyone who has read his half-baked writing. But Quitely’s amazing art almost makes up for that. Almost.